We often say at NFI, we are about the business of "increasing the proportion of children who grow up with 24/7 dads." What does this mean? Well, it means we are happy to align ourselves with people and organizations which work promote protecting children and stengthening families. It’s not easy to be close as a family today. In today’s world, moms, dads and kids all have things tugging at their calendars. We must work together as families in order to stay close and connect with any true meaning. In this busy world, moms and dads sense the pressure to make the “perfect” parenting decisions, only to be judged or criticized by other parents. Moms get the attacks of judgement on topics and personal decisions like going back to work and feeding the baby. Dads get judged on things like their position at the company, whether to stay home and/or how their kids act in public. From styles of discipline to 8pm bed times, I'm reminded of the saying, "opinions are like armpits—everyone has one and well...(you may know the rest!)." This is why we promote the StrongMoms Empower™ campaign by Similac® (a call-to-action to create a more supportive and less judgmental environment to empower moms to be confident about the decisions they make for their children and their families) and National Family Month (NFM) (which occurs every year between Mother’s and Father’s Day). 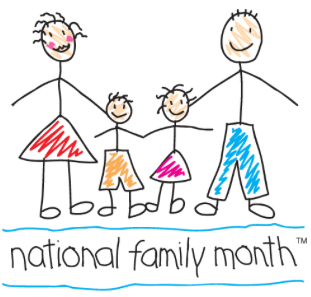 National Famliy Month's goal is to "Build a nation of confident kids by growing stronger and healthier families and encouraging families to support one another." Anything we can do to shed light on this movement, we stand ready. We thought it was a perfect time to consider our families and how to make them stronger. Strong families share many of the same qualities. Here are a few examples:. Strong families build trusting relations by following through with promises. Strong families feel like a team. They share traditions like having a family picnic on the Fourth of July or taking walks together after dinner. Family members show commitment to the family by making time for family events and making sacrifices for one another. Members of strong families talk to one another about important decisions and daily plans. They discuss feelings as well as day-to-day activities at school or work. When there are conflicts, strong families take time to cool down before responding. They don't bottle up their anger or let it get out of hand. They talk about possible solutions to problems and work together to carry out the best solution. All families experience crises. Strong families use these experiences to learn and grow. They know even bad experiences can bring about good changes and help them to become closer. They admit problems instead of hiding them. They seek help when needed. Strong families spend time together, talking, reading, playing games, taking walks, cooking. Some special times involve closeness, like reading a good-night story and tucking children into bed with a kiss. Strong families know that having fun is important and make plans to have fun together. They plan family trips or parties. Strong families know that laughter is important and use humor to help reduce stress. Family members laugh with one another, not at one another. No matter what children say or do, they need to know that their parents love them. Strong families show caring in many ways. Family members say to each other, "I love you" or "I'm happy we're in this family together." They give hugs and show affection in other small ways. They may call each other nicknames and enjoy remembering family stories. Meet eyes when you speak. Say "please" with your requests. Let your "no" mean no. Let your "yes" mean yes. Go to a ballgame together. Have family dinner at home at least twice a week. Say, "I'm proud of you." Be home when they are home. Make "I love you" the last thing you say every night. Say, "Good morning!" cheerfully every morning. Make a dinner date for just you and your child. Make a campfire and sing songs. Stop what you are doing and listen. Lie on your backs and look for shooting stars at night. Teach your kids how to save money. Develop a kid's-eye view of the world. Take a family vacation every year. Show and tell your love for your spouse. Read a best-selling children's book aloud.